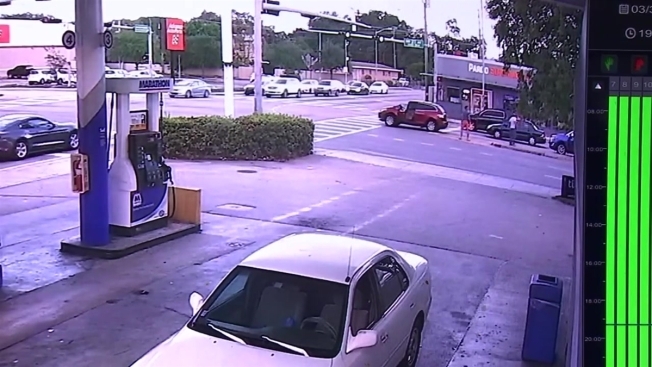 Surveillance video allegedly shows Mexican actor Pablo Lyle punching a man during a reported road rage incident in Miami. The man, Juan Hernandez, later died. The footage obtained by NBC 6 on Friday shows the encounter between Lyle and 63-year-old Juan Ricardo Hernandez, who died Thursday at Jackson Memorial Hospital after sustaining a brain injury from the altercation. A police report said the punch and fall to the ground left Hernandez with a fractured skull and internal bleeding. According to the police report, the "Mi Adorable Maldición" star was the passenger in a SUV during a dispute with another car in the area of Northwest 27th Avenue and Northwest 14th Street Sunday evening. The report said Hernandez approached the SUV and started pounding on the window after the two cars stopped at a traffic light. The footage shows the SUV's driver get out and confront Hernandez, as the SUV starts to roll away. The driver runs back to the SUV as the passenger, identified in the report as Lyle, runs toward Hernandez and punches him once, knocking him to the ground, the video shows. The man believed to be Lyle and the driver get back in the SUV, which makes a U-turn and exists the camera's view. The arrest report said the car fled the scene, but a witness was able to catch the license plate number. Lyle was later detained at Miami International Airport and charged with felony battery, the report said. Police booked the 32-year-old actor into jail and he was later released on bond. The actor admitted to investigators that he punched the man once, according to the report. Lyle told detectives feared for the safety of his family during the incident and said he thought the victim was going to strike first. Police confirmed on Thursday that there is now a homicide investigation into the incident. "The prosecution is working with the City of Miami Police reviewing all information and evidence that is coming to us. Nobody is above the law," Miami-Dade State Attorney Katherine Fernandez Rundle said in a statement Friday. Court records released Friday said "enhanced charges are likely to be filed." The records said a hearing was scheduled for Monday in the case. Lyle's attorney, Bruce H. Lehr, told NBC 6 Friday evening that he has no comment "at this early stage of the case." The Jerry ML management agency in Mexico, which represents Lyle, issued a statement in Spanish on Friday saying Lyle wouldn't be commenting on the incident. "When the authorities and the circumstances allow it, we will give the corresponding declarations. We ask for your total understanding and respect after what happened both for him and his family," the statement read, in part. Lyle starred in several telenovelas, including "La Sombra del Pasado" and "Corazón Que Miente." He also made People en Español's "50 Most Beautiful" list in 2015.